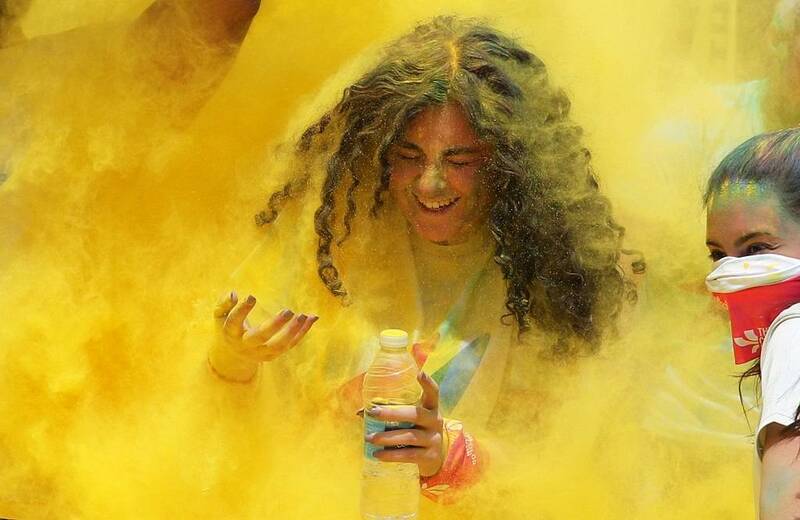 The international marathon, Color Run was held in Egypt on Saturday as thousands of runners were showered with bright colors. The marathon was a first for the north African nation. “ Today, our role is to spray paint on people. It is a powder paint, basically. We are spraying in the green zone, which is zone three. There are four zones. Each zone has a different colour. People come running and we are supposed to spray the paint on them as they come through “, Ismail, a volunteer said. I’m a big believer in leading by example as a parent. So, whenever I get the opportunity to get silly and mucky and dirty and tired and hot and all this, I’m on it. Dubbed, “Happiest 5K on the Planet”, the event took place at the outskirts of the Giza governorate. The runners also enjoyed a group workout session before they hit the start line. Egypt-based Onika Jones, a British citizen who joined the race with her husband and two daughters, said he was proud of her five-year old taking her third 5K run. “ I’m hot, but it is enough for what is going around. I’m here with my two daughters and my husband. I’m a big believer in leading by example as a parent. So, whenever I get the opportunity to get silly and mucky and dirty and tired and hot and all this, I’m on it’‘. I’m really proud of my five-year old; she is running her third 5K today. The only thing she is not happy about is that she does not like any of the colours. So far, we have not come across purple so I’m just putting it out there, Color Run ‘’, a participant, Onika Jones said. Organizer said about 4,000 people of all ages joined the colorful running event. The Color Run is an initiative founded in 2011, with the aim of “bringing people together and making the world a happier and healthier place”, according to project’s official website. It organized 1,000 similar events in 40 countries worldwide, entertaining nearly 7 million participants, according to the website. The show aims to identify interests of various people in diaspora and create a system that integrates them to existing structures and systems as a way to integrate them into being creative contributors to the life in their host countries. The show offer information and educate Africans local and in diaspora about policies and boundaries that govern life within their environments. It will also open up platforms for potential investments, socio-economic, as a way to promote cohesion between hosts all within the host countries. Dexterity Radio: Informing Africa. We take pride in producing content that fosters social cohesion, creating opportunities, informing our people and integrating Africa. We pride ourselves as a 100% black own radio station, with diversity and yet unique in it contents and approach. Copyright 2019 Dexterity Radio. All Rights Reserved.